As this last day of summer winds down, you may find yourself reflecting on all the fun that was summer 2013 in Toronto. 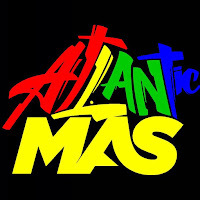 Like me if you played mas for Toronto Carnival you may be experiencing a bit of Carnival Tabanca as you realize you have to wait until next year to start the the Carnival madness all over again. However, my Carnival Tabanca seems a bit more intense this year. This year's road experience on the Lakeshore was far from ideal and left a bittersweet taste in my mouth. Don't get me wrong I still managed to have fun but after about ten minutes on the Lakeshore my band was swarmed and then stalled as non-masqueraders invaded the parade route. The picture below is the point at which my group of friends gave up and decided to leave the parade route. The masquerader to non-masquerader ratio speaks for itself. If you look really closely you can even see the break in the fence. Unfortunately my experience was shared by many masqueraders. And as a result, like many things these days, a discussion developed online on Facebook. A page was created called Time for Change Toronto Carnival and masqueraders shared their disappointing road experiences as well as expressed the need for changes to the parade in order to ensure its survival. Create an exceptional Caribbean Carnival Parade on the world stage. Attendees were also invited to help with the creation of a vision statement for the TMA by indicating what Toronto Carnival means to them and what changes they would like to see implemented for improvement. As a participant in Toronto Carnival as either a masquerader or pan player for the last the last 13 years, I am delighted by the formation of this association. I give kudos to the board members who are volunteering their personal time and energy to give a voice to masqueraders. I was also encouraged by the attendance of the all major stakeholders in Toronto Carnival....the Festival Management Committe, The Toronto Mas Bands Association, The Ontario Steelpan Association, The Organization of Calypso Performing Artistes.....even the Caribana Arts Group was in attendance. Readers, if you are a Toronto Carnival masquerader please check out the TMA. Give them your support, share you ideas, get involved. The TMA has many more positions to fill.